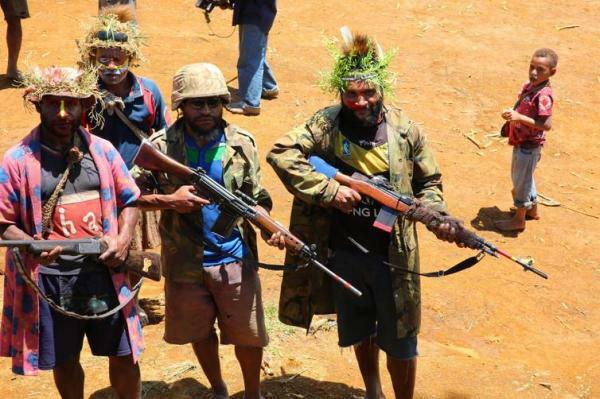 The Paguale Kekero Resources Landowners Association of Southern Highlands province has raised their concerns regarding benefits of the Liquefied Natural Gas project. Yesterday association general sectary Paul Kewai Ipakasa and chairman Simon Kayako told Post-Courier their people especially 11 major clans including a total population of over two thousand people are left in the dark on LNG project benefits (royalty and equity payment). The two raised concerns on issues regarding no agreement signed by them under the Umbrella Benefits Sharing Agreement despite gas pipelines under the Greenfield and future generation’s benefits without guarantee. “Since 2009 till now there were no agreements under Umbrella Benefits Sharing Agreement despite having gas pipeline passing through our land,” said Mr Ipakasa. According to Mr Ipakasa they come under segment 4 and spin-off benefits for their future generations remains uncertain. The two called upon MRDC to consider their issue and put business agreements in order especially to fully benefit landowners whose land has gas pipelines passing through. In relation to Mr Mano’s comments in the article referred to, he explained that while the pipeline determinations have already been made by the minister in reference to the onshore 300 kilometres of the entire 400 km pipeline, those areas not in dispute are being processed and assisted for the flow of benefits. “These are the ones we are going to proceed with their preparations of opening up their account, appointment of their board and then start making payments,” Mr Mano said in the report. He made comments in a previous interview that for upstream pipeline landowners it has been a huge obstacle and that MRDC was aware of landowner frustration, however, mentioned that the areas that are still in dispute will be overlooked and carry on with the ones that are not in dispute pending their outcomes. 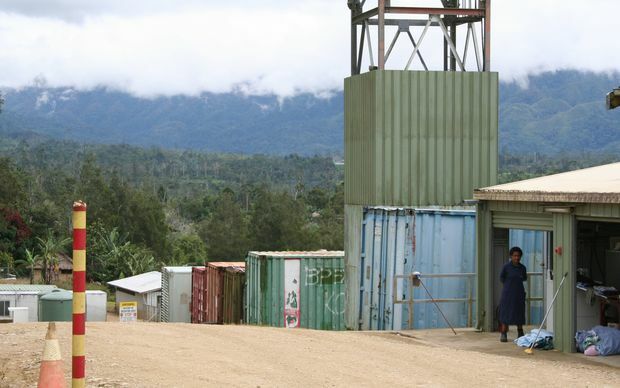 The president of the Resource Owners Federation of PNG Jonathan Paraia has welcomed sentiments expressed by two important persons in the mining and petroleum sectors of the country. Mr Paraia claimed that Mineral Resources Development Company (MRDC) managing director Augustine Mano and Prime Minister Peter O’Neill have expressed disappointment in the current benefit sharing arrangement between resource-owners, the government and resource developers. Mr Paraia praised the Prime Minister and Mr Mano for their views on landowners and Papua New Guineans not benefitting enough and participating in the development and extraction of their mineral and petroleum resources. “Their statements are a truthful admission and acknowledgement of the injustices suffered by the landowners of major resource exploitation projects in the country since colonisation,” Mr Paraia said. He said the State laws on acquiring ownership of all minerals and petroleum resources held under the surface of the land without paying just compensation to the customary owners is unjust. 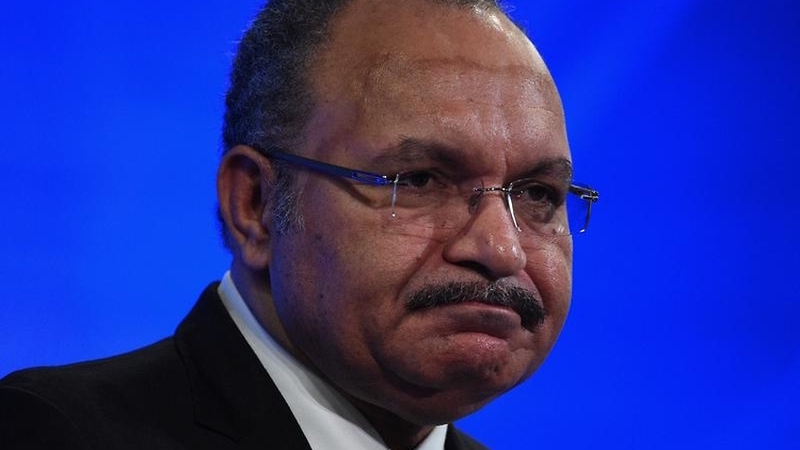 Mr Paraia said it was first introduced by the colonial governments and later adopted by the Independent State of Papua New Guinea, even though those laws are in breach of Section 53 (prohibition of unjust deprivation of property) of the Constitution of Papua New Guinea. He said although a United Nations declaration in 2007 resolved for member governments to remove such unjust laws and restore the ownership of all land and resources acquired by the member States without paying compensation to their traditional owners. 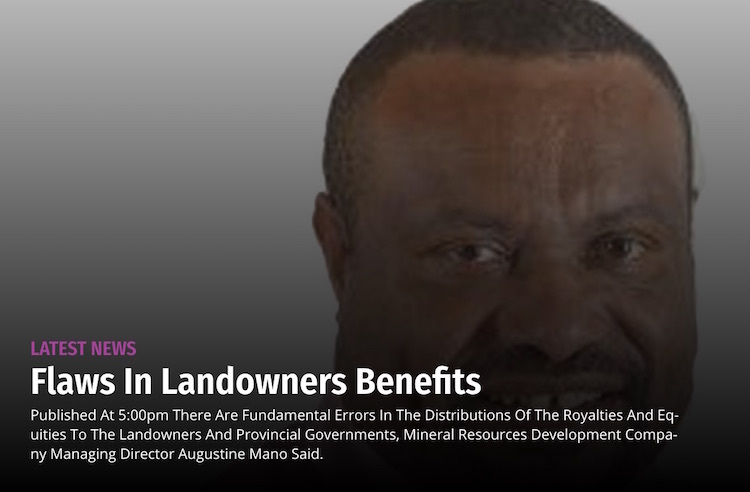 There are fundamental errors in the distributions of the royalties and equities to the landowners and provincial governments, Mineral Resources Development Company managing director Augustine Mano said. Mr Mano said MRDC as the fund manger of the petroleum and mining equities of landowners believes the distribution and percentage given to the landowners and provincial governments were not sufficient when distributing the shares to the many groups. He said in the mining projects, the landowner equity was about 5 per cent and another 25 per cent for the state, a total of 30 per cent but in the petroleum projects it was not the case. He said after 26 years there was a need to change the way benefits were going to the affected landowners and provincial governments. He said a benchmark was set in the Kutubu oil project, the first petroleum project when it was given 6.75 per cent where the landowners were given 4.05 per cent equity and provincial government 2.7 per cent but that was never followed in subsequent projects. “In the petroleum projects like Moran, Gobe and Hides, the provincial governments have missed out equity and there is a need to increase equities to cater for the provincial governments and also the equities for the landowners,” Mr Mano said. He said that ttimes and expectations had changed over time and needs a complete change in the way the equities and royalties had been offered to the landowners and the provincial government with the increasing in demand. Mano said another project was that the landowners’ identification was a major problem which the stakeholders should address before production. He said as a result, more than K450 million was still parked in the trust account because the matters had gone back to court following the failure of the State and the developers to do proper identification. “You are dealing with my landowners who are voiceless and they have to have sufficient funds,” he said. Sounds great, but will the people actually see any improvement in their lives? The historic benefit sharing agreement (BSA) signing happened in Alotau on the weekend between the six mine area villages and the 152 villages from the Community Mine Continuation Agreement (CMCA) regions will share the 33 per cent direct equity interest in OTML. The National Executive Council’s (NEC) decision relating to the granting of the free equity was made in 2014. The benefit sharing Memorandum of Agreement (MoA) took over two years of negotiation amongst landowners, the Fly River Provincial Government and the State. The breakup of the shares will see CMCA group owning 12 per cent, the Mine Area Villages 9 per cent while the Fly River Provincial Government (FRPG) will own 12 per cent. “Now you’ve got one third direct participation. It is for the first time in the history of this country and it’s a big decision the Government has made for landowners to have direct participation in OTML,” Chief Secretary to the Government, Isaac Lupari said. According to the MoA signed, 40 per cent of the benefits from the respective shares will be paid in cash to landowners while the other 40 per cent will go towards investment purposes and 20 per cent will go towards infrastructure development programs and projects. MRDC’s Managing Director Augustine Mano said it was not an easy part but to manage the interests is a huge responsibility on MRDC. “Thank you for the confidence given to us to manage your interest. We will do our best. We will not let you down,” Mano said. The Fly River Provincial Government is yet to sign the MoA and will do so at a later date. Once all parties have signed, the agreements will be submitted to NEC for approval for the transfer of the shares in OTML. Its pleasing to note that the O’Neill-Namah Goverment is really serious about the prevalence of corruption in this country and trying to eradicate it. Corruption is like a cancer that is eating away our country I commend the Goverment for its firm uncompromising stand against this sickness of corruption. In my opinion corruption has become a way of life in PNG and its going to kill this country if we dont join forces and do something positive. If Mr. Prime Minister is genuine about cleaning corruption in this country, then he must first carry out cleaning exercise in the departments/agencies that are under his jurisdiction. He must start with his wantoks who are corrupting this country. One of the most corrupted agencies under the Prime Minister’s jurisdiction is the Mineral Resources Development Company and Group of Companies. This important organisation is headed by Mr. O’Neill’s wantok, Mr. Augustine Mano who is alleged to have stolen millions of landowners money in the name of investing for them. MRDC manages hundreds of millions of oil, gas and mineral resources owners funds, future generations fund, project funds etc. According to a confidential brief, the MRDC under Augustine Mano has spent hundreds of millions of investments for landowners. However, the manners in which these transactions are conducted appear to be disturbing and illegal as they are done outside normal procedural requirements and processes. The current management is riddled with serious cases of non-compliance and deliberate avoidance and ignorance of set procedures and processes, more so in isolation of the MRDC Board. The Managing Direcotr is a young man with no experience at all in high level management exposure which is why he is very sloopy and incompetent in the important office he occupies.He never got the job on merit. He came in through back down…in fact he bought the job. Augustine Mano will go into the history books of PNG as the most travelled head of a government agency in a very short span of time. The rate of Mano’s travel is measured in such a manner that, in a month, he stays in the MD’s office for 3 days, meaning the rest of the days he is out on travel overseas. So in a year, his total clocked in time in the MRDC office would be a month. The cost of his travel is excessive and far exceeds any agency’s budget. He appears to be the most costly head of a govt agency. He must have made hundreds of thousands of kina through travel allowances and other benefits at the expense of the landowners. There is a “Confidential Brief” regarding Serious Issues of Management and Miscounduct at MRDC prepared for the Chief Secretary dated 6th May 2011. I am sure most of the State agencies, such as Police, Fraud Squard, Ombudsman, Transparency International, Media, Prime Ministers Dept, and other state agencies have this report in this possession. I am sure the Prime Minister has this Confidential Brief with him. We landowners are watching you very closely to see what kind of action you take against the MRDC Management. Augustine Mano has recently been seen walking in and out of your office and we know your relationship. If you are serious about corruption then you’ll have to start with MRDC, which reports directly to you!